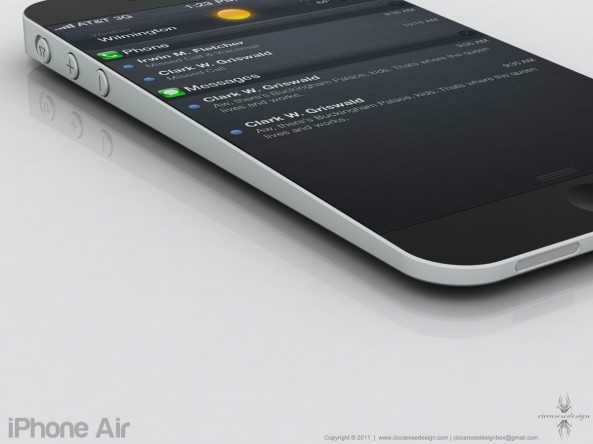 The new Apple iPhone 5 is launching within the next couple of months, and it will be called the iPhone Air, this is how it should be. No one knows what it is going to look like but if this is the real design then we will all be jumping for joy. 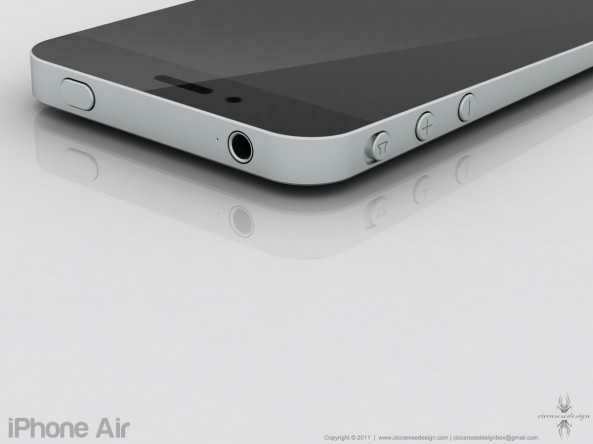 Ciccarese Design has come up with a concept that we believe Apple should make reality, the iPhone 5 aka Air is what is all about, a cross between the new iPhone 4 design mixed in with the little MacBook Air love. It starts of at the top as the iPhone 4 (Sort Of) and then tapers to a thin tapered edge at the bottom (Sweet is the word here). This looks totally stunning, when it comes to the design of a mobile phone you cannot beat the Apple, make it open source and then all will be on the happy train. 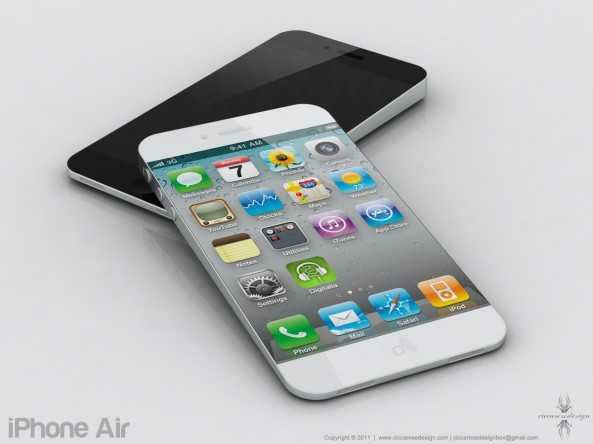 It features the awesome edge-to-edge touchscreen display; surely these renderings of the iPhone Air could come true. If Apple can get so much power into the MacBook Air can you imagine what they can get into the next-generation iPhone coming in September? Personally an edge-to-edge display is a little silly, like iDB suggest “How would you get an iPhone case on it”, that is a valid point. Why is Apple keeping the design a mystery? Come on Apple just give some sort of insight to the next release of the iPhone, it is all about titillation just to stop iOS users swaying onto the Android side. Excite and they stay, disappoint and they go. Simple process really, Apple really needs to pull something good out of the bag, the specs need to be amazing, and the design if like the iPhone Air will turn heads. If you like for a bit of fun until the real official announcements come in, why not send us some of your designs of what you think the iPhone 5 will look like. Grab a piece of paper or use your computer / laptop and email us at mark@phonesreview.co.uk your iPhone 5 designs, add a few specs and features into the mix as well if you like. Really looking forward to hearing from you all, thanks again. Previous article Previous post: Apple Pondering Purchasing B&N? OOOOOOOOOH What’s all this then . . .